The Hogg Foundation for Mental Health hosted the Young Minds Matter: Transition-Age Youth seminar in Houston, TX on April 3, 2013. The free, one-day seminar brought together youth, families, school teachers, counselors and administrators, health care professionals, mental health service providers, advocates, community organizations, nonprofits and many others who care about the mental health of children, youth and their families. 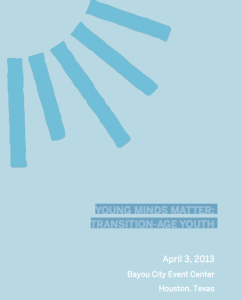 This year’s seminar focused on transition-age youth (TAY), young adults between ages 14 and 24. With a keynote presentation on the Transition to Independence Process (TIP) model by Dr. Marc Fagan and three stimulating panel discussions, the conference focused on how to engage youth in their futures. The information-packed seminar highlighted strategies and tips for successfully transitioning youth.